Target: Designed with fun in mind, the Park is the one kite that does it all – any rider, any style, any condition. The Park's 3-strut design and Swept Compact C outline provides a stable and responsive kite. The powerful profile and leading edge give the rider good low-end power and consistent pull over a wide wind range. The Park utilizes just enough sweep to maximize depower and allow easy relaunch. The Swept Compact C platform remains very close to a real C-shape in order to provide the crispness and feel in the bar that you really need. What's New: We focused on the low-end power delivery without losing any of the light, crisp feel. LE percentage and profile depth have been tuned to improve the low-end pull. We also slightly reduced the sweep in order to get the overall platform closer to a real classic C-shape. To maintain the relaunch characteristics, we slightly extended the wing tips, to keep the same leverage on the overall kite when the rider pulls on the back line. The Result: The rider can expect earlier planing without sacrificing handling. The bar feel is crisper, which means the rider can better feel what the kite is doing and can steer it with precision. The relaunch is also improved over last year’s edition. This is a playful kite and really comes into its element in its high end reach. The Park is very responsive and has a nice pop followed by a long sweetspot. Freestylers will value its sweetspot for handle passes. Want more feedback? On the leading edge, you can adjust your bar pressure on the steering- and depower lines. For beginners it has a couple of good characteristics like its stability, relaunch and depower. It should however be noted that the kite is somewhat too explosive. Also, a starter is of course better off beginning in milder conditions, in which the Park is less into its element. 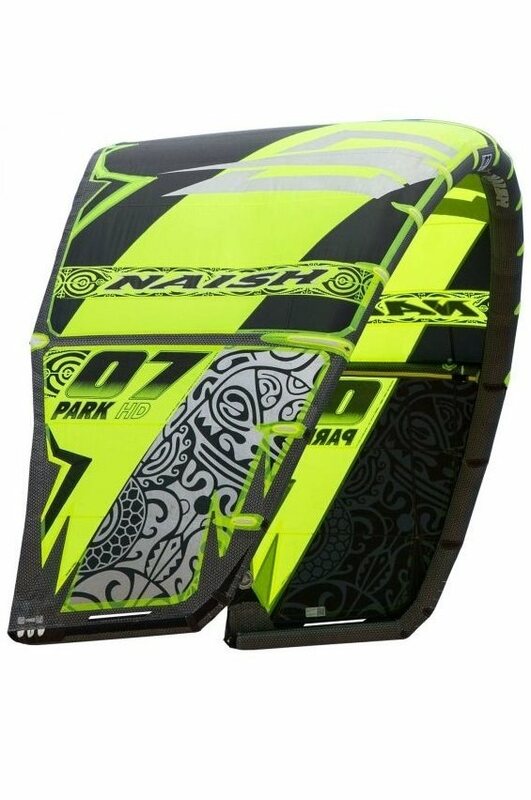 All in all, welcome to the Naish Fun Park! Take it our for a spin when there's a lot of wind and you'll enjoy it for its fiery character. first safety is good: total depower on the bar, second safety system is a one line safety after pulling the quick release. Hard to restart after pulling the quick release.